Before the Storybook Land Canal Boats opened, the original boat ride under and through the wooden trestles of Casey Jr. was called the Canal Boats of the World. Walt's original plan for Disneyland was to include an entire miniature land on the same par with Frontierland and Tomorrowland. Now just nine months after Disneyland opened, the original plan for "Lilliputianland" could be realized. 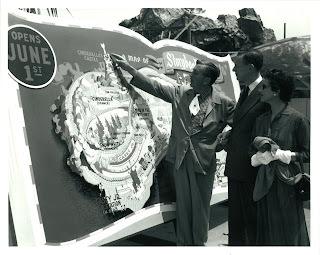 In this photo Walt shows off a giant storybook map of the new attraction under construction. Walt's characteristically pointing with two fingers to Cinderella's castle, the crown jewel of the new ride. Each miniature's location has already been mapped out, including the nation where the story takes place. Perhaps this was a way to link the theme of "Canal Boats of the World" to "Storybook Land Canal Boats"
I just found your site and I love it! Casey Jr. is one of my favorite attractions, and the Ticket Booth is my favorite structure at Disneyland. I'll be reading your previous posts and adding you to the links on my blog. Thanks for you passion. I ditto vintage Disneyland tickets. Starting to look like a very cool site. Keep it up.